This undated postcard from the early twentieth century (ca. 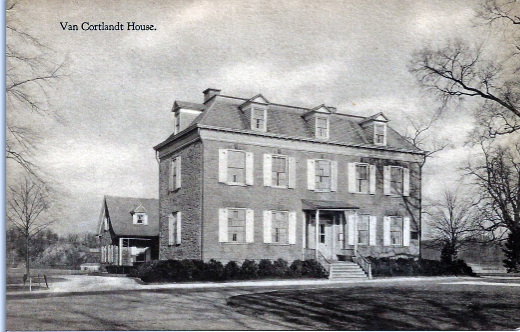 1915, if we had to guess) shows the Van Cortlandt House in the Bronx, one of the stops we make in the chapter of Footprints in New York that details the history the Delancey family. Considering how easy the house is to reach—it sits less than a ten-minute walk from the northern terminus of the IRT No. 1 train, the city’s oldest subway line—it’s surprisingly empty. In fact, when I visit, the only other person there is a Dutch woman, who is very concerned with carefully examining every souvenir in the tiny gift shop. It is a recurring theme that the city’s more off-the-beaten-path historic sites are either empty or, if they do have visitors, they are schoolchildren or foreigners. Where are the American tourists? Safely ensconced on Manhattan, I presume. Soon, I discover that the Dutch woman and I won’t have the place to ourselves. A costumed interpreter—I’ll call his garb late-Colonial/early- Revolution—is leading a group of two-dozen fourth graders down the house’s main staircase. “Everybody likes to play!” he admonishes to no one in particular. “There’s a time for play. But there’s a time to be serious!” I will hear this advice reverberate through the house a few more times during my visit, though I will never see him or the children again. As the children’s footfalls fade, I am left staring into the house’s formal parlor at a portrait of Frederick’s son Augustus van Cortlandt. In the years leading up to the American Revolution, Augustus—a Patriot—was New York City Clerk; in 1775, he spirited the city’s records out of Lower Manhattan to this farm, hiding them from the British in his father’s burial chamber on nearby Vault Hill. Tremendous care has gone into furnishing this home, from the seventeenth-century Dutch room on the second floor to the “best” bed- chamber used by George Washington on his visits to the house. That room features a beautiful mahogany dressing table and an English chest of drawers from 1725, both of which descend from family members. They've draped a blue coat and a tri-cornered hat on one chair, as if General Washington has just stepped out for a moment. If you haven't had a chance to visit the Van Cortlandt House, it's a worthwhile excursion. The resources page of our website has information about visiting the house and other spots mentioned in Footprints.